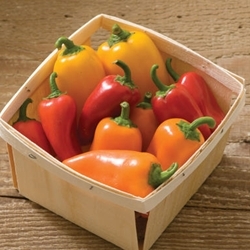 These beautiful mini peppers are remarkably sweet and flavorful. They can be sautéed, added to salads and perfect for a healthy snack. Of course they are certified organic. This is a trio of three plants, one of each color, red, orange and yellow. Plants are not sold separately. The plants are the same size as the other peppers and will be in cow pots.